Manufactured from hi-spec moisture resistant MDF, our window boards are both durable and elegant in equal measure. Customise the dimensions of your window board using the options below. 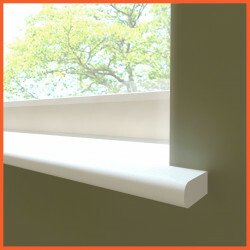 We now offer window boards fully finished in white gloss or satin paint along with the option of adding a ‘tongue’ so that your window board arrives ready to install.